If I were to get stranded on a desert island and allowed to pick just one person for company, Carrie Harris would be at the top of my list. Perhaps we’d starve in a matter of weeks (FINE, days! ), but we’d at least go down laughing. Carrie’s foray into Middle Grade fiction couldn’t have been more successful if she tried, and I get the distinct feeling that this lady doesn’t need to try very hard. That’s the real beauty of her prose – her sense of humor, utterly ridiculous as it may be, seems effortless and smooth, never the least bit forced. She did, admittedly, keep it a bit in check, this being an MG novel and all, but her lovely nature still shines from every page. Middle Grade fiction or not, Sally Slick is Harris’s most mature work to date. A more careful reader will be rewarded by the strong feminist undertones that permeate every page. Sally refuses to live by the social norms, even though she lives in rural America in 1914 and she’s only 14-years old. She wants to be an inventor, not a housewife, and she wants to race tractors with her brothers instead of spending time in the kitchen with her mother. 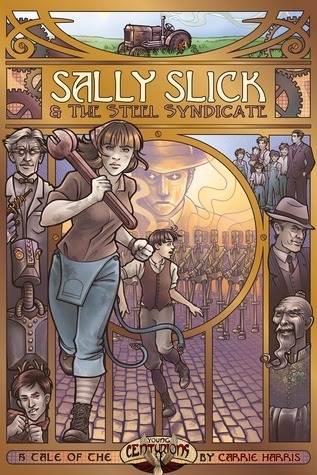 In Sally Slick and the Steel Syndicate, Sally and her best friend Jet take on bullies, mobsters, the Steel Syndicate, and, worst of all, older brothers. They are resourceful and smart and they always stand up for themselves. Sally is unflinchingly loyal and she relentlessly defends those she loves. But of course, Sally is not the only shining star of this book. There is also her best friend Jet, a clumsy, awkward, geeky kid, a follower by nature, but one with a lion’s heart. It is virtually impossible not to fall in love with this kid and wish to adopt him. Geeky and awkward or not, he has a spectacular future ahead of him. Read this book. Share it with your daughters, nieces, and really, women of any age. When you’re done, share it with the boys as well, they have a lot to learn from it. And while you’re at it, read it out loud to your family pets. Every living creature in this world should meet Sally and Jet. Ooo how fun! I haven't seen this one before but your review definitely has me wanting to pick it up! Sally and Jet sound so awesome to discover. It's a new one for me I didn't know this one. If I understand well, it's a real book right? because with the cover it makes me think of a comic. I do love Carrie Harris. She's got a wicked sense of humor and her female characters are so damn smart and well-written. Definitely checking this one out! Like a lot of others have commented I don't normally read middle grade book, but this book sounds far too adorable to be missed out on. Sally in a lot of ways reminds me of myself, as all I wanted to when I was younger was ride around with my cousins all day, I never once wanted to stay in the kitchen, even now I do everything I can to avoid it! Lovely review hun! I love a good middle grade and anything that makes me laugh is a plus. Thanks for the review. I've never heard of this author, but the characters in this MG book sound fantastic. I will definitely have to look this book up. I'm growing a bit tired of the run-of-the-mill Percy Jackson-like books. ugh I been reading so many middle grade books how did I miss this one? :D sounds like a delight, and I am glad the author has a wonderful captivating writing style. I love Carrie's sense of humor, and Sally sounds like a wonderful heroine. I can always get behind a protagonist who shirks the norms and goes her own way. Jet sounds delightfully geeky and sweet too! I had no idea Carrie had a middle grade book, but now it is definitely on my must read list. Thanks for sharing your lovely review! Another book to add to the list for the bf's niece! Thank you, Maja!